When you see a mushroom, you see only a teeny tiny part of a HUGE living thing. The rest of it is underground. The underground part is called a mycelium. Two or more are called Mycelia. A mycelium looks like a bunch of tiny tubes as thin as hair. One mycelium can have so many of them it can weigh more than a WHALE. All of that is attached to the mushrooms we see! So what does that have to do with what the tree said to the other tree? From the outside, trees seem like they are all minding their own business. But they are not. Mycelium tubes spread out and connect with tree roots. The trees share food with the mycelium, and the mycelium shares food with the trees. The mycelium tubes connect one tree to another tree, and THAT tree to another tree. The trees send food to each other through the mycelium tubes! Trees don’t just send food through their roots. They spread important tree news too! 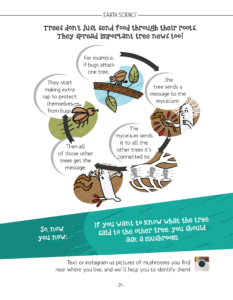 So now you Know: If you want to know what the tree said to the other tree, you should ask a mushroom. This article first appeared in Issue 01 (Aug/Sep 2017) of Smore.